I just finished the first version of a library + firmware that allows streaming of video data over wifi using packet injection and monitor mode oon the esp8266. I plan to use it to replace the finicky WN721 wifi cards that I’m using now with something I have more control over. I’m testing using NodeMCU ESP12F modules and the results are very good. This lib + firmware allows you to inject and receive packets using an esp8266 module. It’s meant for streaming data – like video – similarly to the wifibroadcast project, but instead of using of the shelf wifi dongles with patched firmwares, it uses the esp8266. Sending and receiving data packets up to 1376K. Data is sent through the SPI bus in packets of 64 bytes. When receiving you get the RSSI as well, per packet. Changing the channel. *This is broken for now as the radio doesn’t seem to react to this setting for some reason. Getting stats from the esp module – like data transfered, packets dropped etc. A FEC_Encoder that does… fec encoding. It allows settings as the K & N parameters (up to 16 and 32 respectively), timeout parameters so in case of packet loss the decoder doesn’t get stuck, blocking and non blocking operation. Both classes can be used independently in other projects. There is also a test app (esp8266_app) that uses them and sends whatever is presented in its stdin and outputs to stdout whatever it received. You can configure the fec params, the spi speeds and the phy rates/power/channel. If you want to debug an Android application that needs USB tethering – say a FPV app – then you can use the following steps. You need to first connect the device to the same wifi network as your PC. Then start the USB tethering and provide internet to whatever you need – say a Raspberry PI running wifibroadcast or my RC software. For a multirotor to fly, the thrust of each motor has to be equal, within certain tolerances. These tolerances depend on the bandwidth of the multirotor which are usually reflected in (well tuned) rate PIDs. The rate PIDs are usually tuned to reach the best impulse response which depends on the moment of inertia (radius, mass and mass distribution) and thrust inertia (prop weight, motor power, ESC, etc etc). Unbalanced motors result in a steady-state error for the rate PID which it has to compensate for using the P and the I terms. Going too high with either term – higher than the multirotor bandwidth can allow – will cause oscillations and instability. It might seem obvious that unbalanced motors are bad. In the end all motors – even high end ones – tend to have slight Kv differences which results in different thrust for the same PWM input. It happened to me when I last tested my quad – it kept flipping over at launch and I didn’t understand why the PIDs cannot compensate for this. All other quads work and surely they have their own unbalanced motors. So when I got home I measured the Kv of each motor and I found that one of them is lazier – around 90% thrust compared to the others. So I fired up the simulator and added some randomness to each motor thrust (between 80% and 120%) and yes – the quad wouldn’t fly. The rate PID was unable to compensate for the difference in thrust. Increasing a lot the P term or a bit the I term stabilized the quad. But what if I couldn’t increase the P or I because of oscillations? What if my PID was at its limit, stability wise? Then the quad would not be able to fly with this particular combination of motors and moment of inertia. Seems like a silly conclusion – if the motors are bad the quad will not fly – but I felt like I had some sort of epiphany that the thing responsible to compensate for bad motors is the same thing responsible for fully using the quad bandwidth – so unbalanced motors need some bandwidth margin to allow the PID to compensate for them. There is just enough clearance for 7 inch props and the quad is free to rotate around one axis (Y or roll in the video). I can easily change the free axis as the cords connect to the arms with metal hooks. The issue I’m debugging now is related to a tendency of the motors to generate different thrust for the same throttle input. I think it’s because the ESCs have different settings on them as I couldn’t find any issue with my code so far. If I send 50% throttle to all motors the quad spins a lot. In my last post I talked about using the si4463 chip to send video, telemetry and RC data to the quadcopter. I calculated the bandwidth and it seemed that 500kbps video with 5/7 FEC coding should be possible. I wrote the code, linked everything together and it kind of worked. The video was stable, not many packets lost but the latency was pretty bad. It got up to ~200ms from the current 100-130ms but worse than this, the video was very choppy. I managed to narrow it down to the H264 codec in the raspberry pi: the bitrate you configure in the codec is an average bitrate, per second. Each frame can vary a lot in size as long as the average is preserved (with some allowed over and undershoot). I got I-frames of 12-16KB and P-frames of 400-500 bytes (at 30 FPS). The I-frames took way longer to send than the P-frames and this resulted in a choppy video. I tried to play around with settings – like disabling CABAC and activating CBR but nothing made the bitstream uniform enough. The final, biggest problem was actually caused by the RF4463F30 module – and it’s the same problem I had months ago when I tried to use them: they introduce a LOT of noise in the power line, enough to cause all the I2C chips on the quad to fail. I tried all kinds of capacitors to decouple the module and reduced the noise a lot but there seem to always be some capacitive/inductive coupled noise persisting. In the end I just gave up and went back to the RFM22B chip which just works. For video I went back to the monitor mode/injection system but did change the modulation to CCK, 5.5Mb to hopefully reduce the possibility of interference with other 2.4Ghz RC systems. CCK is spread spectrum similar to DSSS and should be able to coexist with RC systems around. It’s been a while since my last post and that’s not because I abandoned silkopter, but because I’ve been very busy working on it. During my latest test 3 weeks ago I noticed that the video link is not as stable as I wanted. I’m using a system similar to wifibroadcast – wifi cards in monitor mode doing packet injection. They are working on 2.4Ghz and the area where I’m flying seems to have this band a bit crowded, causing the video link to be glitchy. On the other hand my 433Mhz RC link has been pretty solid. So inspired by this I started thinking if I could do the same thing: send video through my RC link. I already had the RF4463F30 transceivers which are using the si4463 chip and I knew them well (and hated them a lot) so I thought to give it a try. Now – the max bandwidth the si4463 supports is limited to 1mbps which might seem like enough for 640×480 resolution but there is a lot of overhead that effectively limit this to around 755kbps. Since I want some FEC – say 5/7 coding – I end up with 500kbps target video bitrate. 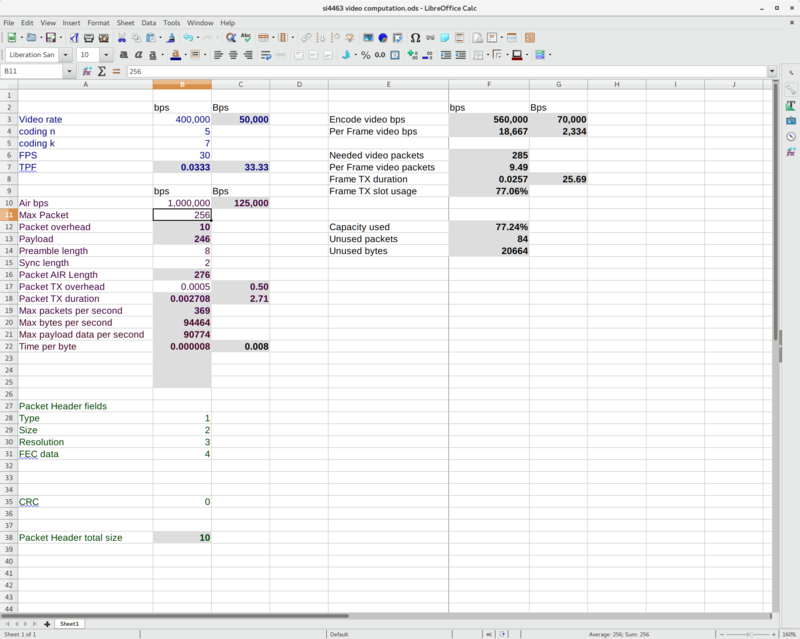 I made an xls to ease the calculations. It allows me to specify the air bitrate, packet sizes, packet overhead, video bitrate, fps, preamble/sync sized, header sizes etc and calculates all kind of nice info, including if the link is viable or not. For the video link, 500kbps seems like enough as there’s not a lot of movement in a quad, specially with a gimbal. To further improve quality and decrease latency I’m experimenting with the x264 software compressor library instead of the GPU compressor in the PI. It seems to be able to compress real-time a 640×480 video with good quality, zero latency setting and 2 cores only. I still have to compare the quality between the 2 (GPU and x264) though. After a few more failed attempts to print the RC case with ABS I finally gave PLA a chance. Ordered some black 1.75 filament from amazon and a few days later I printed the case successfully from the first try. PLA is great, it’s easy to print, it smells like sugar when printing – as opposed to the chemical smell of ABS – and the quality is really good. However it doesn’t like to be sanded. At all! It’s like trying to sand rubber – or more accurately – sugar. I decided to stop worrying about the finish so much and ordered some plastic primer and white matte paint. In the meantime I finished the RC PCB and made all the connections and did the first real test. The screen is connected through i2c1 at 1Mhz together with 2 ADC sensors (ADS1115). I’m using this library to talk to the screen but noticed that a full display update takes ~20-30ms during which I cannot talk to the ADC sensors. To fix this, I changed the library and implemented partial screen updates. Now I can call screen->displayIncremental(1000) and the class will send incremental lines to the screen for 1000 microseconds (1 millisecond). The overall FPS is the same as with full updates but I get to do other things while the display is being updated. To avoid tearing I also added double buffering to the class and an explicit swap method. The end result is a 40-45 screen updates per second but each update is split in 12-13 partial uploads with ADC readings in the middle. So I can sample the ADC at ~600Hz which is more than enough for a RC system. The RC has 13 buttons and 2 rotary encoders requiring a total of 17 GPIO. Since I didn’t have enough I ended up grouping the 13 buttons in a matrix of 4×4 following this tutorial. This allows me to reduce the number of GPIO to 12 (8 for the matrix and 4 for the rotary encoders). I implemented the matrix reading using PIGPIO and added some debounce code to avoid detecting ghost presses/releases. Seems to work great and it’s very fast. Most of the HW is done and it’s a mess of wires. I’m working now on some videos of potting it together, making the connections and the calibration. The next step is to work on the phone app to receive the video feed, although I think I will give the quad a test – line of sight. I really want to fly soon.